Electronic Settlers of Catan Settlers of Catan for iPad, Nintendo DS, Xbox 360, and PlayStation 3!! 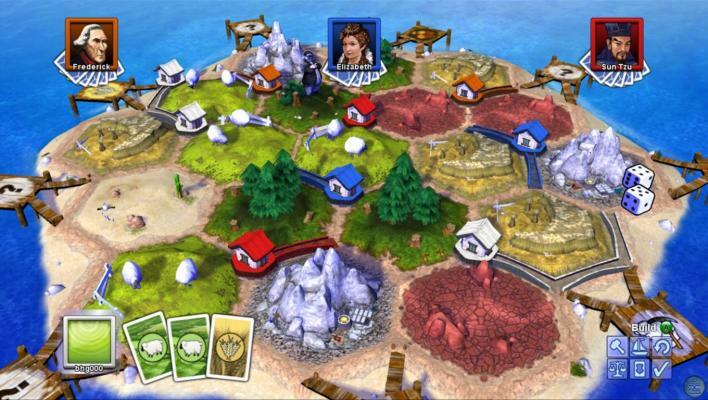 Settlers of Catan for iPad, Nintendo DS, Xbox 360, and PlayStation 3!! Xbox Live Arcade is the online game service for Microsoft’s successful Xbox 360 console. On a platform that is both intuitive and innovative, players from all over the world get together and compete in exciting online duels. Now the board game “The Settlers of Catan” is a part of Xbox Live Arcade as well. Big Huge Games, one of the top developers of PC games, was excited to tackle this project. Brian Reynolds, the developer of such classics as „Civilization II" and „Rise of Nations", is a big fan of the board game himself and a specialist in the localization of demanding AI opponents. A very productive collaboration with Klaus Teuber developed, resulting in a most outstanding AI. The developers of Big Huge Games have accomplished awesome things in other areas as well. The game adapts very well to Xbox‘s simple operational concept and also allows a smooth game flow over the Internet. Up to 4 players compete according to the rules of the base game. Additional features such as permanently available communication via headset are a perfect fit for a highly interactive game, such as Catan.